This is Eddie Rodger, one of a dying breed of artisan sign writers. Eddie and his team offer an unprecedented standard of hand-painted designs that use pure sable brushes and the highest quality enamel paint to ensure an impeccable and beautiful finished product. 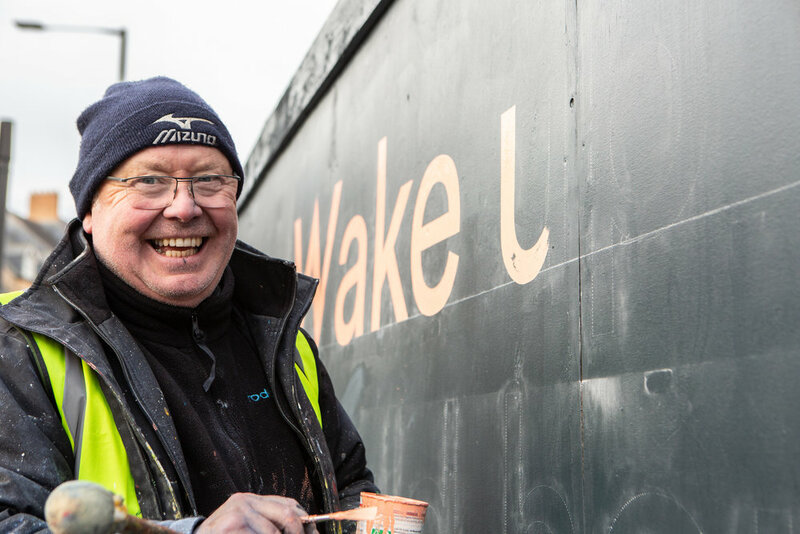 Traditionally used for unusual surfaces, brickwork, plastered surfaces, boats and extra-large lettering on buildings his services are most commonly used in conservation areas, heritage sites and on buildings and interior walls of pubs and public places. That’s why when we were looking to refresh the hundreds of metres of hoarding that envelop the Milburngate site, his tremendous skill, vast experience and attention to detail felt like a natural choice. The immaculate quality of our new hoarding certainly lives up to expectations. So, the next time you pass Milburngate, why not take a minute to pause and admire the craftsmanship and skill required to create something so perfectly executed; like us, you won’t be disappointed. You can find out more about Eddie and his business here.